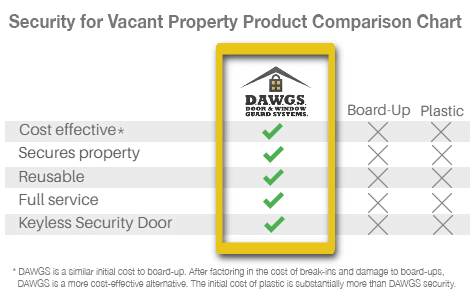 Whether you’re looking for an impenetrable door guard, window guards or both, DAWGS has the security solutions to grant your vacant property security needs unmatched protection. Designed for versatility and strength, there’s nothing a DAWG can’t do. Our modular window and door guards are designed to fit virtually any opening, giving your building an unparalleled level of security. And since these door and window guards can only be installed and taken down with our own unique tools, you know that nobody can access your property unless you want them to. Our service teams install and remove DAWGS quickly, ensuring that you have them right when you want them and never a day longer. Powder coated in a neutral color for easy cleaning, DAWGS blend right in, giving your building inconspicuous security and a dramatically upgraded exterior appearance that lasts.